Around these parts, it feels like the glory days of summer. The tomatoes are (finally) ripening! The Nuni has finished summer school and is now living out my nostalgic old-fashioned childhood summer dreams at day camp where she gets to swim and ride horses and do archery and build forts and generally have a grand old time. We have been working diligently at our summer bucket list (last weekend: farmer’s market and train ride. Next up: s’mores, and the obligatory weekend hammock time). Hard to believe we are back to school in a month! Tomatoes are finally peaking at the farmer’s markets (and if you planted yours earlier than I did mine, in your garden), and now is the perfect time to capture that ripe goodness in a jar. 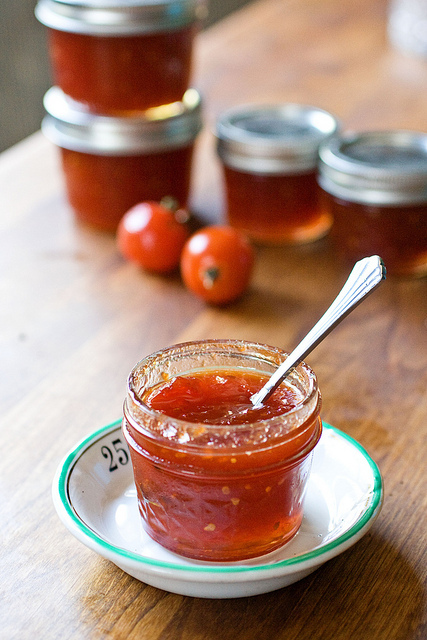 Sweet tomato jam might sound weird, but the flavor is just wonderful – familiar and exotic all at once. This one tastes exactly like the one my great-grandma used to make. Get a look at this amazing house (just purchased by Andy Samberg) in LA’s Beechwood Canyon featured on Curbed LA. Mary Astor and Charlie Chaplin once lived there, and it’s a Moorish fantasy, with ornate ceilings, Moroccan tile designs, stained glass, a door with carved camels on it(!) and a cave(!!) near the swimming pool. There also appear to be white subway tiles in the kitchen, if you’re worried about the hipster cred. I’ve been totally obsessed with Moroccan tile designs lately, so this is right up my alley and some serious eye candy. If you haven’t read Bossypants by Tina Fey, you have to. Rebecca Traister (whom I have long loved) wrote a great piece on being a woman in a man’s world that’s worth a read, and makes excellent use of one of my favorite anecdotes from Bossypants. I wear glasses almost every day (my job involves a lot of computer time, and if I wear my contacts, I’m crying uncle by 4 pm), and have to recommend these frames. First of all, Zenni is generally awesome -I buy prescription glasses from them all the time, but these, which I totally bought on a whim, get complimented EVERY SINGLE TIME I WEAR THEM. Seriously, I have gotten compliments on them from the other moms at daycare, my daughter’s teachers, my boss, the checkout guy at Trader Joe’s, my dental hygienist. And they only cost me $50, WITH LENSES. I know the World Cup is over and nobody in the US cares about soccer anymore, but I, for one, have a newfound love of the sport. It’s so dramatic! Every time a player gets a scratch it’s a federal offense! It’s a lot like living with a seven year old, frankly. Anyway, NPR covered this phenomenon beautifully, and asked the question: What if we lived life as if we were in the World Cup?